Secrid Miniwallet Vintage -lompakon nahan pinta on hieman hangattu ja viimeistelty vahalla, mikä antaa sille rosoisuutta ja särmää. Siihen kertyy ajan mittaan persoonallisuutta ja merkkejä elätystä elämästä. very nice quality and design, the size is perfect. +Great leather feel, good build quality and very compact wallet. 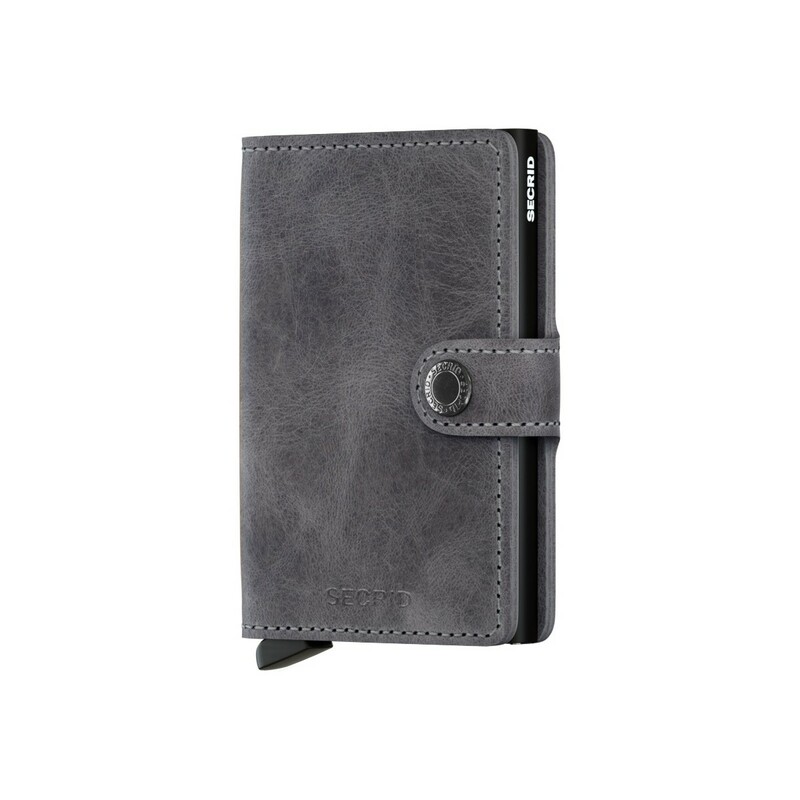 It can store 5 cards at the aluminum case and about 4 extra cards at the leather case. -The shipping was bit long and storing coins is not convenient. Great product and 100% authentic. Will order again some items soon. Great wallet, great site service, arrived Israel within 1 day (!!!) as promised. I warmly recommend this product from this specific seller. Thanks a lot! Well, it's really amazing , excellent quality.. Very helpful with my cards and a little cash..
and the best thing is the price from MUKAMA comparing with the other stores..
You may consider the slim wallet design. One more thing I didn’t find a way to drew banknotes quickly from the wallet but still my Overall opinion is very good and i will recommend this wallet to my friends. Excellent. Quick delivery, great quality! I love this wallet! Its small and just enough to carry all I need. I have ordered two miniwallets from the Mukama store. Quality of the wallets is as described on the photos. Very satisfied. Will shop again. I first came across the wallet in-store and appreciated the design and workmanship. Mukama had more colors to choose from and as I was ordering additional items, the shipping cost was very reasonable and express delivered right on time. Overall I'm impressed with the quality of the wallet and it suits my needs fine. Leather quality is good, one comment is I noticed the stitching along the edges of the wallet are not 'finished', ie. there's a bit of leather which flakes off during initial use but that is normal and it doesn't degrade the overall finish but something to be aware as I don't think the pictures really show this. The card slide is functioning as expected and no issues with card falling out during normal use - only time will tell whether the mechanism holds up with daily use. 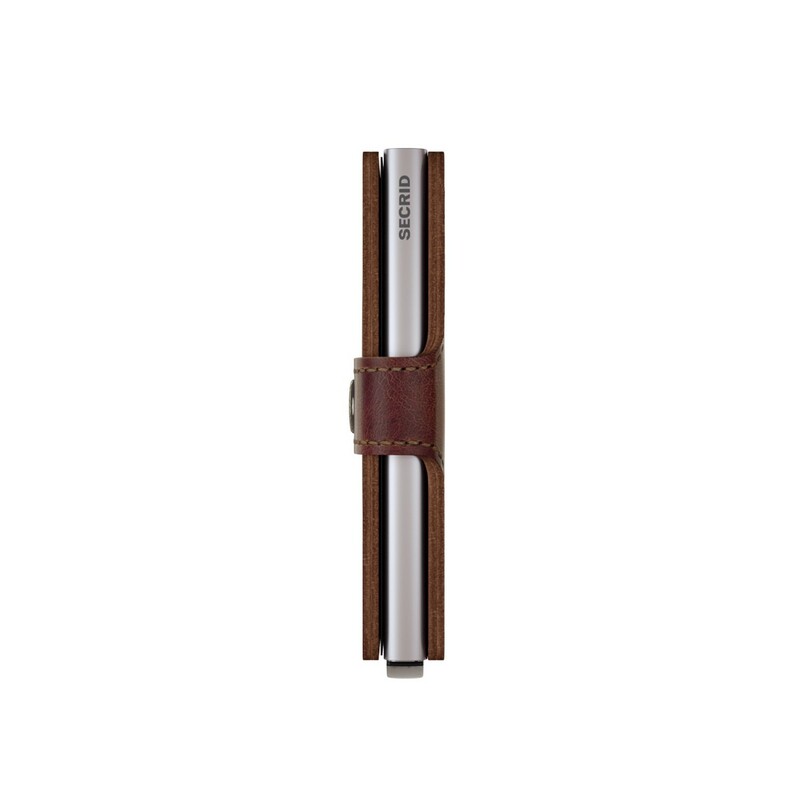 The wallet will make a great gift for those who appreciate a minimalist but quality wallet. This is the second Secrid product I bought from Mukama and I couldn't be happier, I love slimmer and smaller wallets and this one fits my needs perfectly. The quality is outstanding, both the card protector case and the leather finish on the wallet itself. I get complimented on it a lot, and a lot of people ask me how and where I purchased it, I just refer them to the Mukama site and I know they will be happy customers. super fast delivery! great product. highly recommended! We had seen the wallet before and we knew what to expect. Still the wallet managed to exceed our expectations. It works smoothly and looks great! Husband loves it. I like the compactness of the wallet. 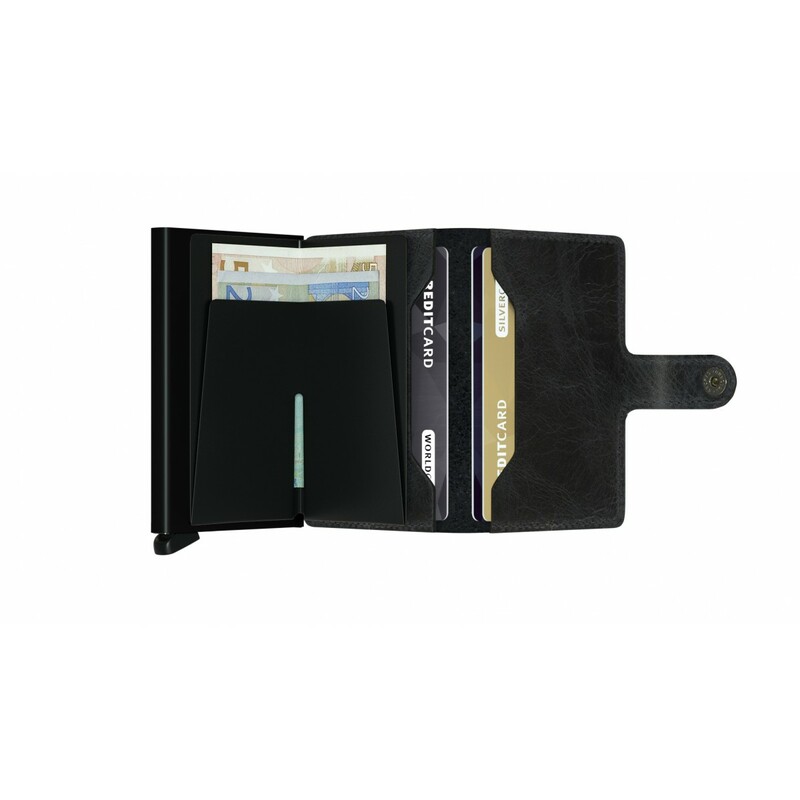 Allows me to carry reasonable amount of cash and the cards i need for daily use. The price of the wallet is affordable. The quality of the leather is good. Really great looking wallet in my opinion. Compact and stylish. 1) The metal case that prevents wireless theft of cards info of the cards it's holding also blocks the functionality of cards in the leather pockets outside of it! This means I have to open the wallet every time I want to open the door of my office - I couldn't just bring it near the sensor. This is really frustrating. 2) Side pockets on leather casing are advertised to keep 2 cards each. When I tried that right after unboxing the wallet, it was really really tight and the wallet just barely closed. I doubt anybody would really like to carry it around that way. So in reality I'd say they are suitable for just 1 card each. 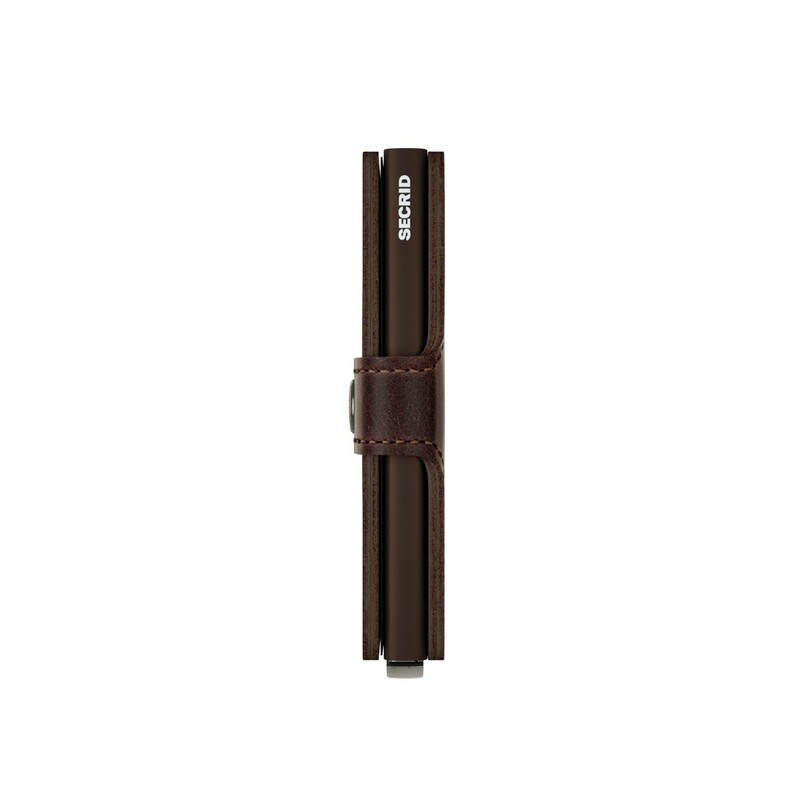 3) I purchased the Vintage Brown mini wallet, I think it looks awesome out of the box. 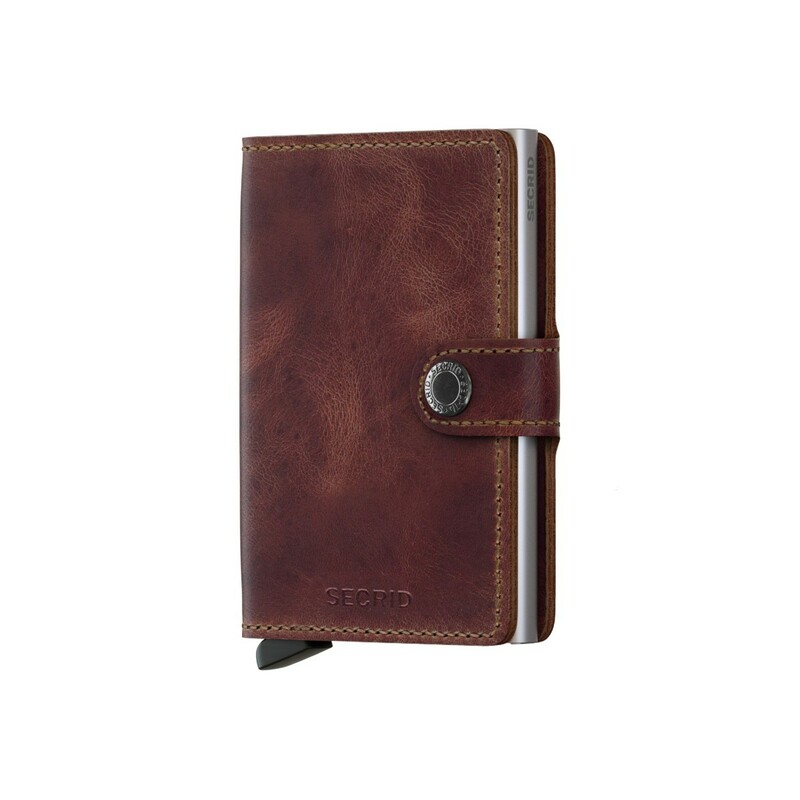 The problem is the leather of the wallet is extremely prone to scratches. After just a couple of days of normal use, my wallet is covered with scratches. I didn't even put it in the same pocket with keys or other sharp objects. Consider these factors before buying. i love this wallet. Its very small and the perfect EDC for me. i can fit 6 cards (3 embossed). Material feels & looks premium. im thinking about getting another one in different color! cons: im not used to my notes being folded the way it is in this wallet (i have only been using "normal" wallet before). Also because of our currency is made of plastic material (as opposed to standard paper material) the creases is more pronounced. But so far no issue with auto-pay machine etc. I'm very pleased with the wallet. Just as described, arrived very fast. Pleased with the wallet, everything was great, came fast to Estonia and owner is also happy with the quality. I’ve owned the wallet now for 6 months. I LOVE it! Love showing it off and having my bills secure and giving me space for around 5 business cards makes it a must have for networking. Not to mention sliding the latch and having your cards fan out. It’s always impressive! Great Product! very small in comfortable to use. The delivery to New York was surprisingly very fast! The shipment was very fast within a few days. The vintage blue mini wallet is exactly how it looks in the photograph. My husband is delighted with the product! Very nice wallet, happy that i bought him. The Secrid miniwallet is perfect, I've bought it to my boyfriend as present for his birthday since it was the one he saw(and felt on love) in Tampere on our little farytale trip. The site Mukama is really easy to use, delivery was much faster then expected and I was trilled and suprised when the wallet arrived! I got as a present, really lőve it.Smart and small. I've had this wallet for a few weeks now and I'm super happy with it. It's stores a lot more than you would expect and it provides easy access to both cards and cash. I got the Vintage Chocolate version and the leather looks and feels amazing. Bonus points for it arriving in less than 48 hours. Overall I would highly recommend this wallet to everyone. Great wallet, very happy with all parts. Fast shipping. I love this wallet. The size is great, the quick access to credit cards is convenient, and the quality of the build is high. My only criticism is that US dollars don’t quite fit. It is possible for a few bills, but the length of USD requires some clever folding. It’s not a big deal to me because I rarely carry cash, but something to consider when buying. Excellent product! For a very long time I was in search of a compact and easy to use wallet, especially for the credit cards (and also other usable discount cards or transportation cards). The leather is premium quality and indeed with the usage it looks even better (I have the vintage brown version of the miniwallet). I really love the simplicity and how compact and easy to use this wallet is. I also have to add the great service and fast shipping. I'll come back for sure to Mukama! This is the second wallet that I'm buying - Great product, Great service!!! Fast delivery and product is of good quality. Small size large capacity!!!! room for small change. Good quality and its looks awesome!!! Absolutely loving my Miniwallet. It's compact, holds everything I need and stylish too. Also like the feel of the champagne antique leather I chose. I hope it comes out in more fun colours, as well as with an actual coin pouch at some point? Item delivery is faster than expected and the item is good quality. Happy and satisfied with purchase. Thank You. The shipping time was under 1 week. Reliable company and service. I love this wallet, cool and small. Many people asked me about it. A revolution in wallet's world! Very good in all positions. Bought the miniwallet as a present for my brother and he loves it!! 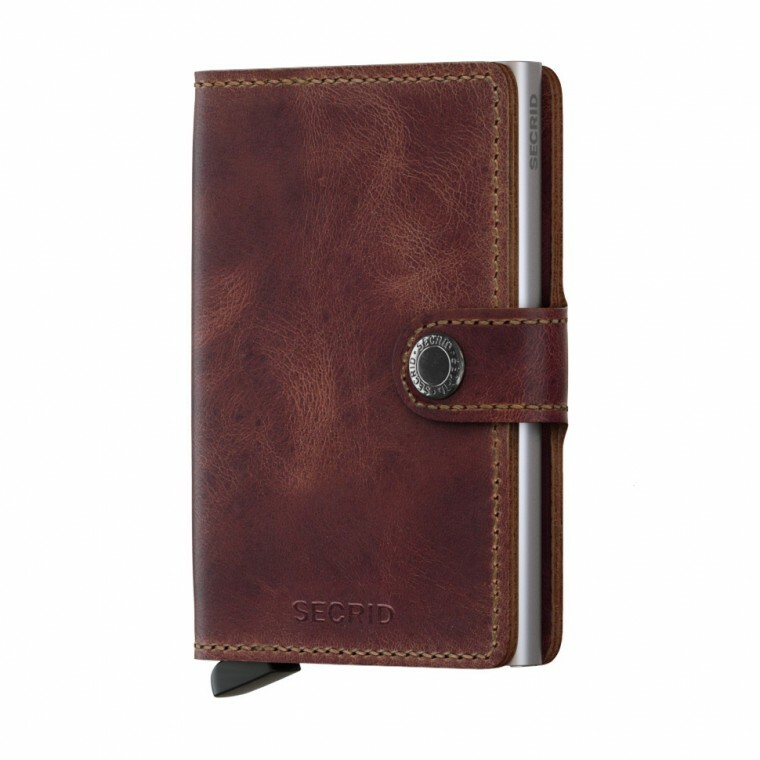 The sleek design and premium leather makes the Secrid is a best choice for a present. Thanks. 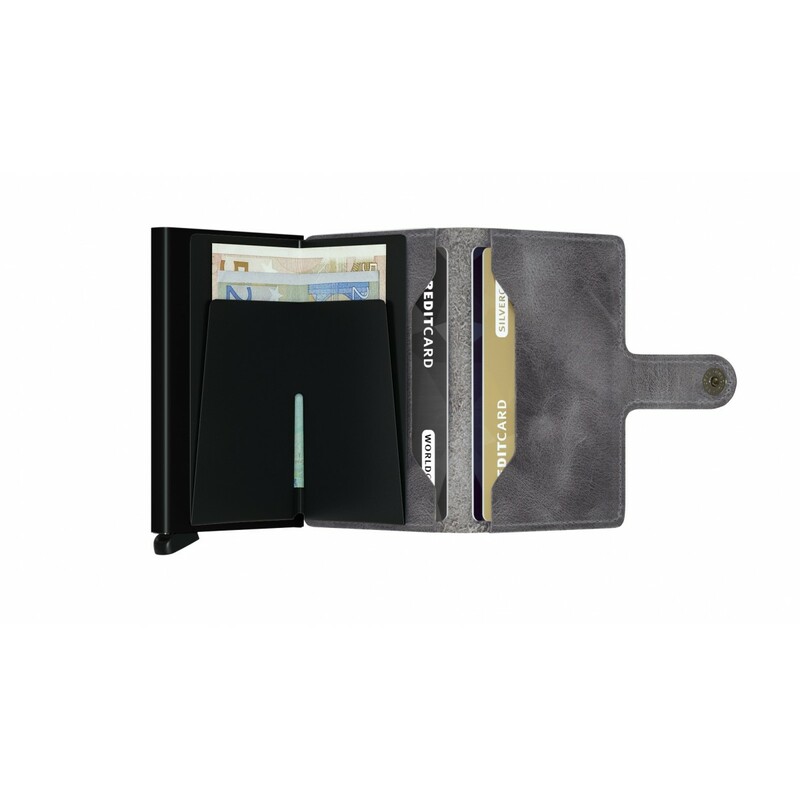 Very minimalist and functional wallet with alternative colors. It takes 7 days to get it from Turkey, no problem during purchase & shipping. I highly recommend the product and Mukama. Thanks. do the work for every men! Lovely wallet, clever and neat. The way it pushes the cards out is really useful. Friends all admire and it costs a lot less to buy from you than elsewhere. I bought one for my guy and myself and we love it so much!! Excellent! Amazing! And one and only! My secrid wallet arrived here in New Zealand in only two weeks and I am very happy with it. I purchased it from Mukama as the price was a lot cheaper. Amazing product and great service. Although it was during Christmas season it only took a few days to arrive. The wallet is a brilliant invention, one of my best buys ever. Had no problem doing the hole process, ordered monday - received a confirmation 5 min's later, the shipment was sent and 4 days later I had in Aarhus, Denmark. Tuote oli just eikä melkein sitä, mitä tuotekuvauksessa luvattu. Lahjan saaja oli erittäin tyytyväinen! Odotukset oli korkealla runsaan positiivisen palautteen takia. Vähän jännitti se ,että pärjäänkö ilman kolikkotaskua, mutta hyvin onnistuu, kun nykyään korteissa on lähimaksuominaisuus. Nyt lompakko on siirtynyt povitaskusta farkkujen etutaskuun ja siellä sen on hyvä olla. Ainoa miinus tähän asti on ollut tuo ruskea nahka kun siinä näkyy naarmuja jotka on tullut kynsistä. Muuten kyllä nahka on siisti ja hyvän näköinen. Valitsisin jälkiviisaana ehkä mustan. Luulen kyllä , että vuoden päästä ei enää yksittäisiä kynnen naarmuja havitse ja nahka on kauniisti patinoitunut.. Tuosta huolimatta 5 tähteä kun on niin mullistavan hyvä tuote perinteiseen isoon lompakkoon verrattuna. Paras lompakko mitä olen omistanut. Nyt pysyy kortit järjestyksessä. Hieno ja laadukas tuote. Kaikki tarpeellinen mahtuu hyvin mukaan. Olen etsinyt juuri tälläistä lompakkoa johon mahtuu kaikki korttini ja tähän mahtu setelitkin. Tuote lunasti odotuksenui ja enemmän, laatu mielestäni erittäin hyvä, koko mahtava ja tilaa löytyy kaikelle mielestäni tarpeelliselle. Hyvä tuote! Tosin jos on vähänkin enemmän kortteja, kannattaa ostaa isompi malli. Tuohon ei montaa voi tunkea taskuihin. Tuote tosi hyvä ja laadukas. Pätevä peli. Yllättävän paljon tilaa pienessä kokonaisuudessa. Suosittelen! Erinomainen tuote, nopea toimitus ja mutkaton asiakaspalvelu. Tilasin viallisen kännykänsuojan tilalle ja takuu toimi mutkattomasti. Oikein positiivinen verkkokauppakokemus. Myyjä informoi tehokkaasti toimituksen tilasta. Toimitusaika oli odotettu. Tuote vastasi mielikuvaa ostohetkellä. Suosittelen. Toimiva pikkulompakko, kulkee mukana yhtä hyvin takin- ja housun taskussa. Tulipa hankittua toinen yhtä upea ja käytännöllinen lompakko, ihan vaan varmuuden vuoksi jos tuotteen tuotanto loppuisi! Hanki omasi - tulet ilahtumaan! Upea laadukas ja todella käytännöllinen lompakko joka todella toimii. Kortit nousevat kevyesti yhdellä painalluksella metallisesta kotelosta ja rahat sekä muut kortit sopivat hyvin nahkaiseen läppään! Suosittelen todella! Minulla on jo pari näitä käytössä, toinen upea harmaan grafiitti ja toinen tyylikäs musta!!!! Kokeile niin ymmärrät! Erittäin laaudukas ja kompakti lompakko. Mainio ja fiksukokoinen lompakko. Tukeva ja helppokäyttöinen! Upea tuote - sopii meklarin ja muittenkin käteen ja taskuun! Kokeile! Tosi kivan näköinen ja laadukkaanoloinen pikkulompsa. Tosi kätevä ja laadukas pikku lompakko, tällaista olin etsinyt! Näppärän pieni mm. matkoilla. Tilaus oli helppoa ja toimitus nopeaa. Mukavankokoinen, käteen sopiva pieni lompakko, johon mahtuu kuitenkin kaikki tarvittava. Sopii hyvin housujen etutaskuun tai pieneenkin iltalaukkuun. Kortit pysyvät hyvin tallessa, eivätkä taivu tai putoile. Hieno keksintö! Suuret suositukset! Suosittelen, sekä lompakkoa että verkkokauppaa. Oivallinen, toimiva ja siisti lompakko. 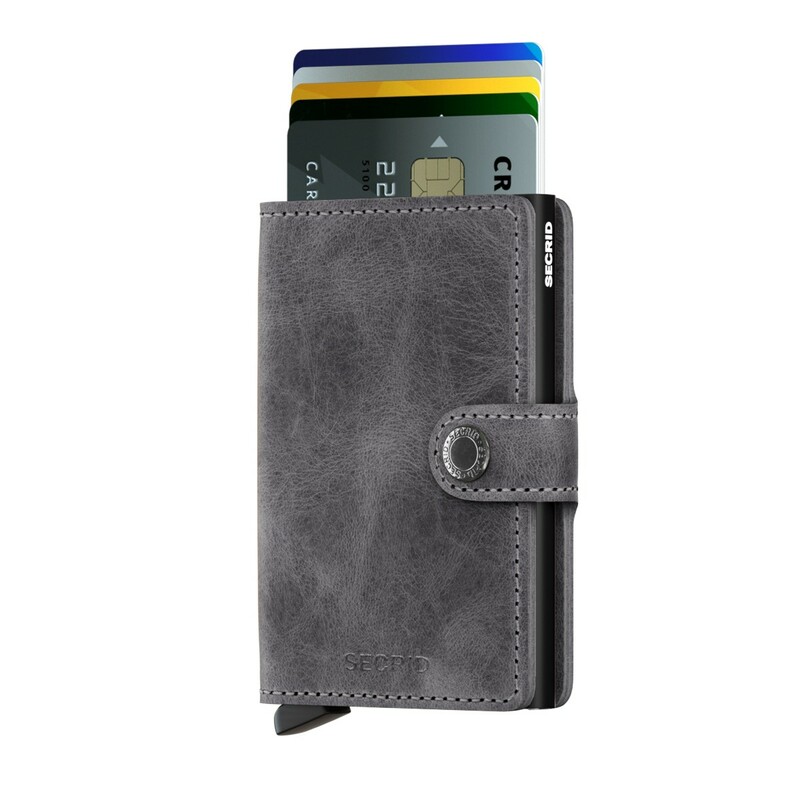 Nepparilla suljettava Miniwallet on todella kätevä ja korttilokero toimii sujuvasti kaikkiin päivittäisiin tarpeisiin. Materiaali tuntuu hyvältä ja laadukkaalta. Mahtuu hyvin kaikki tarvittavat kortit mukaan. Huippuluokan tuote. Tärkeimmät kortit nopeasti esillä ja saatavilla. Pienestä koosta huolimatta todellinen tilaihme. Tilasin Secrid Miniwallet lompakon täysin "sika säkissä" periaatteella. Lompakko on äärimmäisen laadukas, toimiva ja ennen kaikkea kompaktin kokoinen. Loistava hankinta ja nopea toimitus. Einfach genial! Super Teil! Abwicklung rasch und unkompliziert! Alles sehr gut geklappt, Versand schnell, Verpackung sehr gut, Miniwallet bestens im Einsatz!